HBO has released the very first images from the Deadwood movie. After 12 long years, production finally started in November, giving fans confidence that the project was finally moving forward. Now, we have the first look at the return of Ian McShane as Al Swearengen and Timothy Olyphant back as Seth Bullock. The show was canceled after three seasons back in 2006, and a movie has been talked about since then, but there have been a few hiccups in the route to making the Deadwood movie. Deadwood creator David Milch signed on to make a pair of two-hour television films in place of the fourth season in 2006, but HBO later announced that the project had a 50-50 chance of happening. So when it was revealed in 2015 that a movie was actually in the works, fans were initially skeptical. All of the sets were destroyed in 2007, which really made it seem like the movie idea was never really going to happen. But now, with production officially underway, fans have their first look at the movie. 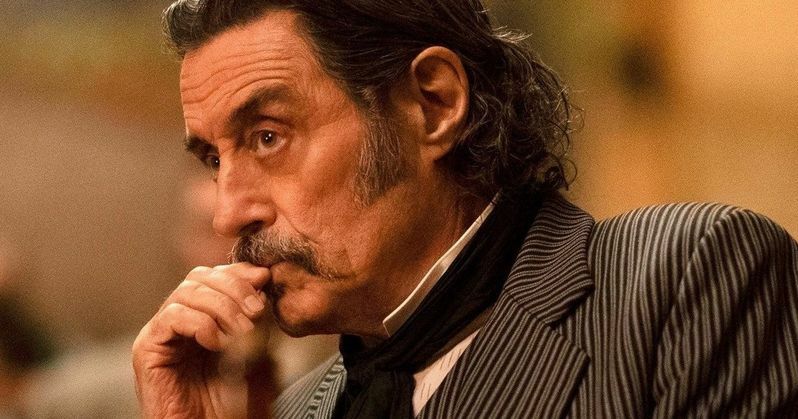 Ian McShane looks pretty much exactly the same as he reprises his role as Al Swearengen for the Deadwood movie. The character is seen at his Gem Theater bar. The second image from the movie is of Timothy Olyphant, who is back as Seth Bullock. The character is now a U.S. Marshal and he looks relatively the same, except that he has some gray in his mustache. Since the first two photos have arrived, the trailer is expected to be on the way. Daniel Minahan, who directed four episodes in the original series is back behind the camera for the Deadwood movie from a script that David Milch has written. Details are being kept under wraps, but according to Dan Dority, the script is "f*cking thrilling and f*cking heartbreaking," which sounds about right for the series. The movie will see the characters reunited after ten years to celebrate South Dakota's statehood. Former rivalries will be reignited, alliances are tested, and old wounds are reopened. Its looking more and more like the movie is going to be exactly what fans have been waiting for all of this time. In addition to Ian McShane and Timothy Olyphant, the Deadwood movie sees the return of Molly Parker (Alma Ellsworth), Paula Malcomson (Trixie), John Hawkes (Sol Star), Anna Gunn (Martha Bullock), Dayton Callie (Charlie Utter), Brad Dourif (Doc Cochran), Robin Weigert ("Calamity" Jane Canary), William Sanderson (E.B. Farnum), Kim Dickens (Joanie Stubbs), and Gerald McRaney (George Hearst). A release date has not been set, but there have been rumors that the movie will debut near the end of 2019. For now, you can check out the first pictures from the upcoming Deadwood movie below, thanks to Entertainment Weekly.